High-energy photon pairs at the LHC are famous for two things. First, as a clean decay channel of the Higgs boson. Second, for triggering some lively discussions in the scientific community in late 2015, when a modest excess above Standard Model predictions was observed by the ATLAS and CMS collaborations. When the much larger 2016 dataset was analysed, however, no excess was observed. Yet most photon pairs produced at the LHC do not originate from the decay of a Higgs boson (or a new, undiscovered particle). Instead, more than 99% are from rather simple interactions between the proton constituents, such as quark-antiquark annihilation. ATLAS physicists have put significant effort into improving our understanding of these Standard Model processes. ATLAS has released a new measurement of the inclusive di-photon cross section based on the full 2012 proton-proton collision dataset recorded at a centre-of-mass energy of 8 TeV. 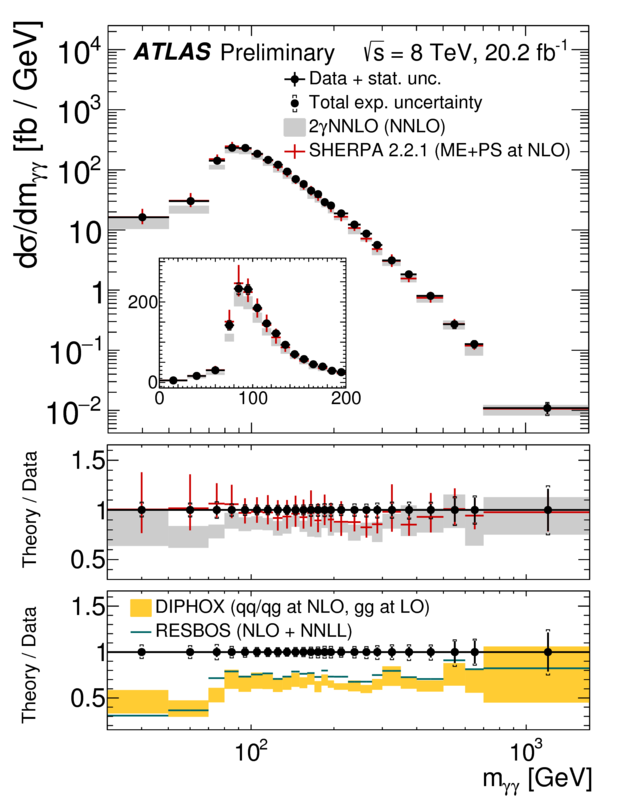 The precision is increased by a factor of two compared to the previous ATLAS measurement (based on the smaller 2011 data sample recorded at 7 TeV), such that the total experimental uncertainty is now typically 5%. According to the theory of strong interactions, the production rate of such Standard Model processes is sensitive to both high-order perturbative terms (more complex particle interactions involving quantum fluctuations) and the dynamics of additional low-energy particles emitted during the scattering process. Theoretical predictions are thus currently precise only at the 10% level. Calculations based on a fixed number of perturbative terms in the series expansion (next-to-leading order and next-to-next to leading order in the strong coupling strength) underestimate the data beyond the projected theoretical uncertainties. In the new ATLAS result, the distortion in the photon pair production rate originating from the emission of low-energy particles has been probed very precisely thanks to the study of two new observables. By accurately modelling the additional emission, the predictions are found to agree with the data in the sensitive regions. These results provide crucial information for both experimentalists and theorists on the dynamics of the strong interaction at the LHC, and should lead to improved Standard Model predictions of di-photon processes.